As many as 200 PT. Transportasi Jakarta (Transjakarta) employees participate in Asian Games Torch Relay, Saturday (8/18).
" This torch relay is participated by 200 of our employees to enliven Asian Games event"
PT. Transjakarta Public Relation Head, Wibowo said, torch relay was started at 6-10 AM from Jl. MH. Thamrin (Sarinah intersection). 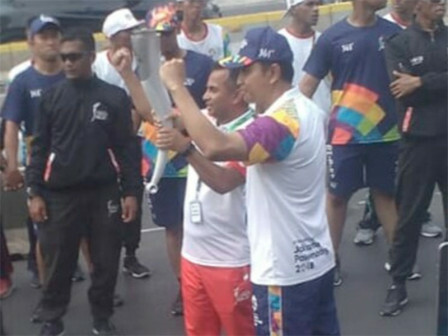 In this event, Transjakarta Operational Director, Daud Joseph got a chance to hold Asian Games torch. "This torch relay is participated by 200 of our employees to enliven Asian Games event," he stated, Saturday (8/18). Previously, his side also participated in Torch Relay held on Tuesday (8/16). In t hat time, PT. Transjakarta Business Process and Development General Manager, Mohammad Shadiq Helmi and Division Head, Muhammad Hartono have a chance to hold Asian Games torch. "50 employees also participated in that event," he added.